After declaring that his favorite new fruits and vegetables include peaches, apples, cucumbers, and zucchinis, 9-year-old Makael Constance of Dorchester hopped down from the podium and started munching on a pint of freshly picked raspberries. It is a habit Makael has gotten into since July, when his family enrolled in the Fruit and Veggie Prescription Program, a mostly privately funded pilot project that aims to increase access to fresh foods by providing farmers’ market coupons. At a press conference outside the Codman Square Health Center in Dorchester yesterday, Makael provided a testimonial to the program’s success in changing individual habits and making farmers’ market goods more affordable. But for some Boston-area markets that have already cut prices to compete with grocery stores, low participation numbers indicate that other challenges loom. Dozens of Bay State families are taking part in the program, which is based in community health centers in Lawrence, Holyoke, and Boston. At-risk patients receive coupons from their doctor to subsidize fresh produce, or about $100 for a family of four. The program also tracks participating families’ health outcomes — such as blood pressure, weight, and body mass index — to quantify the health benefits of increased fruit and vegetable consumption. “I have talked about eggplants more in the last four weeks than I could have ever imagined,’’ said Dr. Suki Tepperberg, a family physician at the Codman Square Health Center who works with Makael and his mother, Leslie-Ann Ogisde. The coupons supplement ongoing efforts aimed at subsidizing fresh produce, such as the Boston Bounty Bucks initiative, which matches farmers’ market purchases made using SNAP benefits, formerly known as food stamps, for up to $10. In some Boston neighborhoods, such as Mattapan and East Boston, the farmers’ markets take place right next to their biggest competitors: supermarket chains. Market organizers said their prices are competitive with those in grocery stores, and they have joined with local groups to get residents out of corner stores that may have fewer healthy alternatives and into farmers’ markets. Yet Mattapan is struggling to gain a stream of regular shoppers at its Saturday morning market, while East Boston’s Thursday afternoon market has become a vibrant community gathering. Last year, the Mattapan market grossed the lowest SNAP revenue in Boston, with 39 transactions from July to October. East Boston drew nearly 200 food stamp purchases in the same period, more than any other site. Even so, Mattapan market manager Jean-Martz Vital remains optimistic about this year’s turnout, which he says started with around four or five customers in mid-July and has doubled or tripled customers every week since. But he is worried about the farmers. He senses skepticism among them about the financial viability of providing fresh produce to Mattapan residents, many of whom are of Haitian descent. 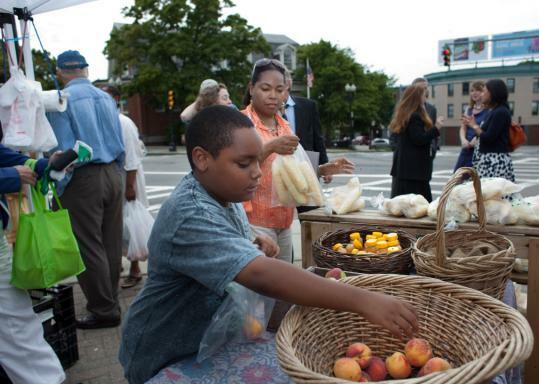 Three farmers participate in the Mattapan market, one more than in 2009. Last week, a potential fourth farmer backed out because he did not think it would be profitable, Vital said. But the farmers Vital has worked with have always been enthusiastic about coming back, he said. Instead of trying to recruit more farmers, Vital will focus on boosting the number of residents who shop at the market this season, which he hopes will attract more farmers. David Dumaresq, who is based in Dracut and runs Farmer Dave’s stand in East Boston, said he tailors his offerings to the cultural preferences of those who frequent a particular market. Residents of the neighborhood, which hosts the largest Latino population in the city, tend to like pipiano squash, radishes, shell beans, and a Brazilian eggplant called jilo, he said. For some, the appetite for fresh, local foods might just be hardwired into their DNA. Carmen Inciso, 76, came to the United States nearly 50 years ago from Colombia, where she grew up on her dad’s small farm. Last year, she visited the East Boston farmers’ market every week, and she plans to do the same this season. Inciso said the habits she formed growing up in Colombia fuel her desire to seek out the freshest produce. “In Colombia, we cooked all day,’’ she said. “We’d go to the farm and pick things we wanted to eat for lunch. Patrick G. Lee can be reached at patrick.lee@globe.com.